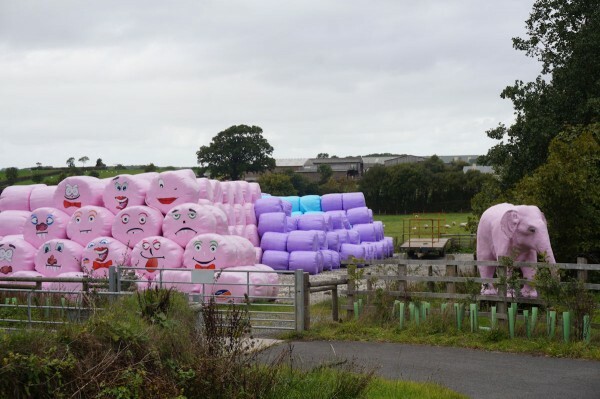 The internet reveals that pink hay bales have been a thing for a couple of years now, to raise money for breast cancer charities. It also reveals that the Hatherleigh community website is running a competition to name the "pink bale people group." And if that's the best name they can come up with by themselves, I'm not surprised they're appealing for help. Nobody has explained the pink elephant. Perhaps one is not supposed to talk about the elephant in the field. So there IS a reason for them! Well, sort of. It was the pink elephant that made me cram on the brakes and blink, though. Is the pink elephant concrete? It's very nice. (I used to drive regularly past a place that sold Jurassic Park-sized concrete velociraptors but I couldn't afford one). I don't know, I didn't get right up to it. One imagines it might cause a certain alarm among passing horses. It alarmed me! Velociraptors would be worse though! It's clearly been a VERY good year. The Elephant is pleased!